Allison Helsinger joined Moore Ingram Johnson & Steele in 2014 as an associate in the firm’s Lexington, Kentucky office. Practicing primarily in Workers’ Compensation Defense and Insurance Defense, Allison is a member of the firm’s Civil Litigation department. Originally from West Chester, Ohio, a suburb just north of Cincinnati, Allison first moved to Kentucky to attend Eastern Kentucky University, where she graduated with her Bachelor of Arts degree in Political Science in 2007. Upon graduation, Allison moved to Lexington, Kentucky to attend University of Kentucky College of Law. During her time in law school, Allison was active with the Trial Advocacy Board, the Student Bar Association, and the College’s renowned, Legal Clinic, providing legal services to low-income persons in Lexington and its surrounding areas. 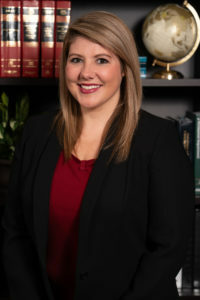 After graduating in 2010 and successfully passing the Kentucky Bar Exam, Allison joined a regional civil defense firm as an associate in their Lexington office where she practiced in motor vehicle liability, premises liability, products liability and some employment law throughout the Commonwealth of Kentucky. Allison is admitted to practice in Kentucky and permitted to appear before the Eastern and Western, United States District Courts as well as the Supreme Court of Kentucky. She is a member of the Fayette County Bar Association, the Kentucky Bar Association, and the Kentucky Defense Counsel. Allison lives in Lexington, Kentucky where is she is actively involved with the Ronald McDonald House Charities of the Bluegrass, Big Brothers Big Sisters of the Bluegrass and the Chi Omega Fraternity. Allison is a member of Chi Omega’s legal education team, traveling to college campuses providing legal education on hot button issues relevant to women attending college in today’s legal climate. She enjoys attending Keeneland, cheering on the EKU Colonels and the UK Wildcats, and spending time with her friends and family.